As I mentioned last week, on Monday I participated in my first LUG: Lotus User Group. I was cordially invited to participate in the Tri-State Lotus User Group meeting. I could only stay for the morning. I got to enjoy Bob Picciano's keynote before my session. You can find a summary of Bob's keynote in Chris' blog. My presentation was about using Tivoli Directory Integrator (TDI) with Lotus Connections and Domino. TDI is a free piece of software that's included with both Lotus Connections and Domino v8+. It's a great toolkit to easily move data from/to Domino to/from Lotus Connections. I used the following presentation to introduce my demo. While I don't have a formal recording, I do have other blog entries with recordings that show how to use TDI to quickly import data to Lotus Connections. The videos are: How To Load Users from a Spreadsheet and How To Load Photos from LDAP. View more presentations from Luis Benitez. 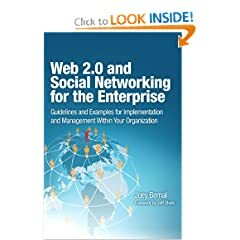 To the first person who asked me a question, I gave away a copy of Web 2.0 and Social Networking for the Enterprise, Joey Bernal's new book which includes a foreword by Jeff Schick, VP of Social Software at IBM. I was one of the technical editors so got two copies and decided to give away my extra one .